If you're a Tigers fan, then Saturday night's game against the Indians wasn't very much fun for you. The offense wasted a one-hit, seven-inning, seven-strikeout gem from Justin Verlander by scoring precisely zero runs the entire game -- and they even got an extra inning tacked on at the end to give them another chance! 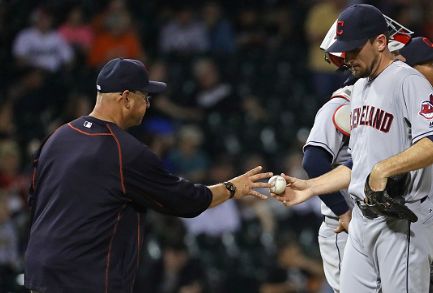 Worse, perhaps, was the fact that the Tigers knocked Indians starter Carlos Carrasco out of the game, literally, after two pitches. Ian Kinsler hit a line drive right into Carrasco's pitching hand, and that was the end of the game for the guy who has held the Tigers to a .150/.203/.183 slashline in four starts this year. If the Indians were going to win this game, their bullpen was going to have to get all 27 outs (or 30, as it turned out), and that's exactly what they did. Now, on the other hand, if you're a fan of sabermetrics and smart managers, then this game was fascinating and fun to watch. Faced with the rather large obstacle of needing to win a "bullpen game," Indians manager Terry Francona rose to the challenge and played a masterful game of strategy. "Tito," as they call Francona, isn't afraid of the advanced metrics. He's not afraid to break the traditional baseball rules. He gives fans like me some hope that maybe the baseball world really is changing. Here's an example: Francona has a DH on his team who is slashing .246/.355/.475 with 32 home runs. Naturally, this guy is batting fourth or fifth in the lineup, right? Nope. He's their leadoff hitter. Francona doesn't care that Carlos Santana isn't your prototypical leadoff hitter with the typical toolbox of slap-singles, bunts, and speed. He cares that Santana has a .355 on-base percentage. And you know, it's funny, speed becomes less important when can do the home run jog 30+ times per season. But back to the bullpen game. Terry Francona just might know a thing or two about the Times Through The Order Penalty (TTOP). The average American League starter sees his opponents' OPS go up 57 points from the first time through the batting order to the third time through the order. That third time through the batting order is a killer for most pitchers. Granted, Francona doesn't have to worry about that as much when his front three starters are Corey Kluber, Carlos Carrasco, and Danny Salazar. But when it comes to someone like Josh Tomlin, whose opponent OPS jumps 63 points the third time through the order, Francona has made sure that only 27 percent of the batters Tomlin has faced were "third-timers." By contrast, Brad Ausmus has let Mike Pelfrey face nearly the same relative number of batters a third time (25 percent of plate appearances to Tomlin's 27 percent), even though Pelfrey's OPS penalty is nearly double that of Tomlin's, at 122 points. For the Indians, an even more specific problem exists: in 2016, their relievers have seen opponents' OPS jump 171 points on just the second time through the batting order. So here's how Francona handled it on Saturday night: he just didn't let any of his relievers go through the lineup more than once. Duh. The most batters faced by any reliever that night was seven, by Andrew Miller, who is easily the best arm in that bullpen. Cody Anderson and Perci Garner both faced six, and Jeff Manship faced five. Those were the heaviest workloads the Indians bullpen faced, and not one of the eight pitchers used by Francona that night gave up a run. Jeff Manship was the first out of the pen and only faced five batters before Francona pulled him in favor of letting Kyle Crockett -- a lefty -- face Jarrod Saltalamacchia and Andrew Romine. It was an odd move, at first glance. Manship wasn't gassed, he wasn't looking like he was in any trouble, this was still only the second inning (and you might like to get at least three innings from your first guy out of the pen in this situation), and the next two Tigers batters were both switch hitters. Ah, but there it is: not only are they both switch-hitters, they are both weaker against left-handed pitching. Francona wasn't going to get beat the first time through the order by ignoring the splits. Another interesting and refreshing move: he brought in his closer, Cody Allen, in the eighth inning. No, I mean, to start the eighth inning. Not to get a four-out save, which would have been weird enough in this era of the Exclusively Ninth-Inning Closer, but to start an inning which was a) not the ninth and b) in a game that was still tied 0-0. Maybe not so weird, though, if you know Francona. One of the cardinal rules of modern baseball bullpen management is that you never use your closer in a tie game on the road. Francona has done that with Cody Allen six separate times already this season. Apparently he doesn't feel bound to manage his bullpen according to the rules. And then, of course, there's his usage of Andrew Miller. Since coming to the Indians in an August trade, Miller has not been slotted into an official bullpen role, which is what most managers would try to do. When he left the Yankees, he had been used overwhelmingly (68 percent of the time) as an eighth-inning set-up man. With the Indians, however, he has been used more like an assassin-for-hire, being called upon whenever and wherever the game situation needs a strikeout ninja with an electric high-90's fastball and wipeout slider. So far, 30% of his appearances have been in the seventh inning, 35% in the eighth, and 25% in the ninth. He has also been used in the sixth and tenth innings. In this game against the Tigers, Miller entered in the top of the ninth, and also pitched the tenth as well. Had the game continued, I have no doubt Francona would have sent him back out for the eleventh. Francona respected the TTOP. Francona respected the batter splits. Francona used his best pitchers "out of order" and in unorthodox ways, because the situations called for it. And that's the story of how Terry Francona put on a master class on Saturday night, not only winning a critical game against his nearest division rival, and not only doing it with just bullpen arms, but doing it in decisive, shutout fashion.